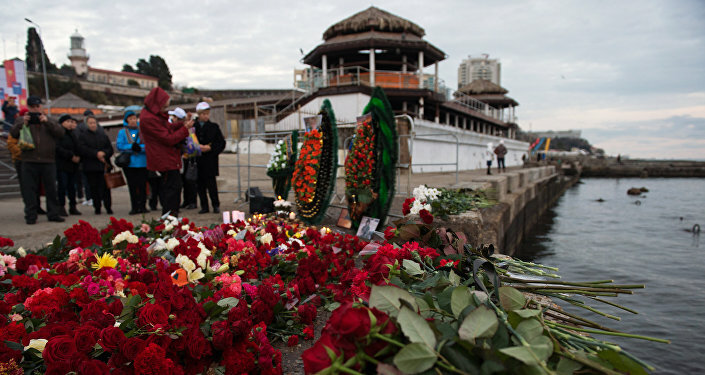 The Russian Investigative Committee denied media reports of overload being the cause of the Tu-154 crash in December. MOSCOW (Sputnik) — Reports claiming that the Russian Defense Ministry plane crashed near Sochi last December because it was overloaded are untrue, Russian Investigative Committee spokeswoman Svetlana Petrenko said Thursday. "The statement in the press about the Tu-154 aircraft overloading, which allegedly caused the disaster over the Black Sea, does not correspond to the established factual circumstances and the materials of the criminal case," Petrenko said. She said the Investigative Committee's military investigative bodies would issue a final decision on the criminal case only after a set of expert studies are carried out. On December 25, 2016, the Russian Defense Ministry's Tu-154 plane heading from Moscow to Syria crashed shortly after refueling and take-off from the Russian southern city of Adler, near Sochi. The plane was carrying 92 people, including eight crew members, 64 musicians of the Alexandrov Ensemble, nine reporters, head of Spravedlivaya Pomoshch (Fair Aid) charity Elizaveta Glinka, and two federal civil servants. None of them survived the crash.